keets is bored outta her tree during this Hiatus o’ Lost Girl, so’s she got herself a little project goin’ ta keep herself outta trouble, an’ ta keep her from buggin’ the crap outta me an’ Bertie. She’s been diggin’ ’round in Art Appreciation or some kinda Art History junk that seems a little tedious ta me, but she come up with some interestin’ pictures; even if mosta her theories is just like throwin’ darts an’ seein’ what sticks ta the board. As long as she’s includin’ my Grandbaby Lauren in mosta the pictures I ain’t gonna complain, ‘specially ’cause I know she ain’t gonna be cuttin’ an’ choppin’ away at the story like some other folks do. So’s…I’ma lettin’ her use my Blog Spot ta post her silly notions. Thanks a lot Grammy Binks. I guess, for that gracious introduction. 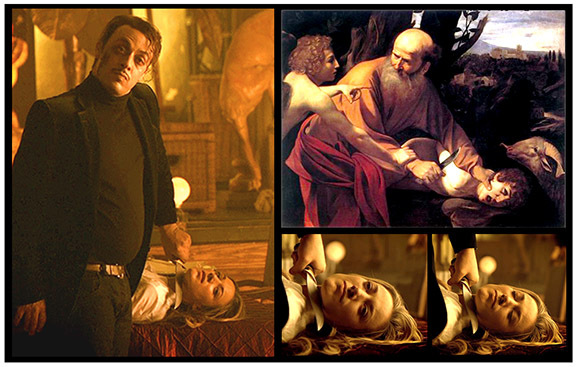 I am a bit at loose ends during the hiatus and decided to take a look at Lost Girl in still life, as a painter might. How does the composition of a certain scene work? How is the lighting used to elicit mood, drama, emotion? The costumes? Can we understand this modern story using simple stills? And can we compare this story to other stories told, in past? Stories told by artists who didn’t have moving film to create their images. Paint brushes, canvas, linseed oil, pigments, models, and natural lighting were the tools of these Old Masters, and some newer Masters as well. I decided to use “Death Didn’t Become Him” (Season Two, ep. 8) as my first comparison piece; mostly because this was the first episode that had me comparing the imagery to paintings I had seen. The attention to detail that Lost Girl utilizes often, and the lighting, has always stood out as dramatic and mood inducing. They may not have a large budget for fancy CGI, but the makers of the Show use their limited resources to give us quality, moving imagery. I’m no expert in this field; I like what I like, and these are some of the images that I like, both old and new. An Egyptian Fae (known as the Lich) has the power to resurrect someone who has recently died, and he uses these bodies and souls of the deceased mercilessly. The Lich is a puppeteer of sorts, tapping into the talents these people had in real life and forcing them to continue to perform for his own personal pleasure, and knowledge. He obtains a recenently deceased friend of Trick ( Christoph, a dancer) and so the story unfolds. Bo, with Lauren as her back-up, proceeds to try and rescue Christoph. A “Salon” performance is held, by which my first comparison is made. This scene reminded me of a painting by the impressionist artist (although he did not classify himself as an impressionist) Edgar Degas. The piece is called “Ballet Rehearsal” Yet, I discovered a subtitle for the piece in which it was also known as: “Fine Art Doll”. 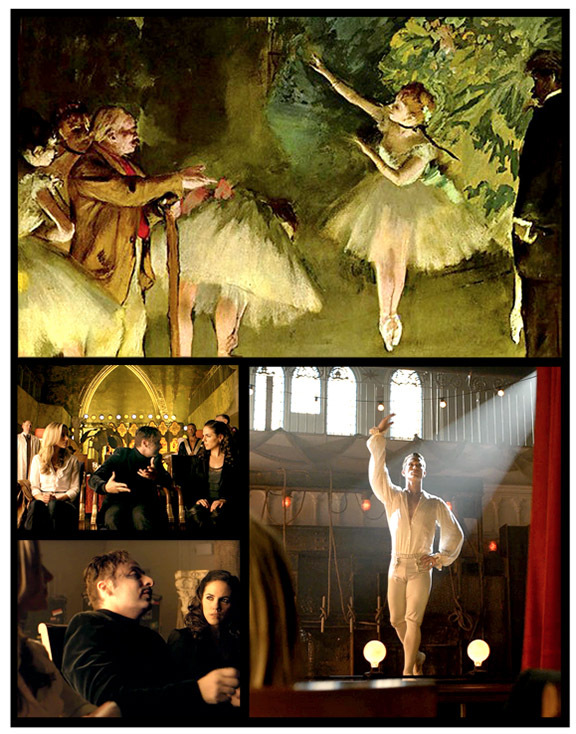 In both scenes (Degas’ painting and the Lost Girl footage) a man is directing the performance of the dancer. The lighting isn’t the same but the mood is. The blocking or organization of space, or spatial relationships is strikingly similar. Each performance is witnessed by others, but it is apparent that the man directing (puppeteering ) is essential to each performance given. The second painting: “The Sacrifice of Isaac” by Carravaggio (the 16th century Italian artist) is more representational and tells the biblical story of Abraham sacrificing his son Issac at the Lord’s behest. In this same episode of Lost Girl (the very next sequence of events) the Lich proceeds to “Sacrifice” Lauren in order to get Bo to do his bidding. In the story of Abraham an angel appears and stops Abraham from going through with the sacrifice of his son. In Lost Girl’s story, Bo becomes somewhat of an avenging angel and stops the Lich from kiilling Lauren. Notice the expression on Bo’s face is filled with fright as that of Isaac’s. Again the spatial relationships are quite similar, and the composition. The angle of threat in the pose is basically the same, the highlights, and the warmth of yellow light is used in both pieces. (Whatever! Look at the pictures and decide on yer own if keets is off her rocker. Lauren was a hella lot braver than that Issac fella; she just closed her eyes an’ waited fer Bo ta do her chi suckin’ business. My Lolo wasn’t all screamin’ an’ panicky like that poor Lil’ Issac in the picture; Lauren had faith in her Bo is why. Um..er…thank you for your comment Grammy Binks. I’ll be looking through all of the episodes over the hiatus and throwing more darts. Next week’s theme: The Lovers. Quite awesome, thank you keets! Thank you for reading Shoe! I think the comparison to “horror” representations would be a wonderful study as well. I’m not very learned in the “horror” genre but I think that would be a really fun project. This last season was especially dark in places and I am looking forward to using some more modern paintings as comparisons. Thanks again for reading. This is brilliant, and well thought out. And I LOVE that you chose a Caravaggio. He is a perfect choice because of the realism in his paintings and the darkness he emanates through his work. Hello Wigga Wig. Thanks so much for reading and your kind comment. Caravaggio is one of my favorites and I want to use a whole bunch of his paintings. There are so many and they all elicit that darkness you mention, which is always present in the underbelly of even the lighter Lost Girl episodes. Keets, this is fantastic! I loved reading it and hope you will write more along the same lines! Bravo. Thank you Cleo! I am excited to continue and appreciate your generous comment. Thank you for reading Baby Doc. Next theme is “The Lovers” that’s likely to be a bit brighter…but maybe not. LOL..
keets, this is amazing and I love it. I know nothing about art (except “I like that!” or not), but I know that I like it when someone who knows about it leads me through an explanation like you just did. I hope you post again and again on this topic. It gave me the chills, in a good way!